Upgraded .187" Cable with 3/16" prop shaft. This is cut and ready to install in your boat. This upgraded cable is a higher quality with thicker wire strands and better aligned to the prop shaft then the stock unit. This replaces the stock two piece cable with a single piece cable. 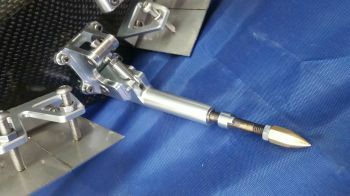 Because of this, the cable can be removed without having to totally remove the strut or motor. Which makes greasing the cable, MUCH easier. This can also be used in any other boat requiring a .187 cable that measures approx. 10.31" (262mm) from tip to tip. NOTE: Because of the many variations of this boat on the market we can only guarantee this cable fits into the hull sold by OffshoreElectrics. Some TFL Pursuits come with .150 cable, if this is the case and you are upgrading to the .187 OSE cable, this will not work without the following additions, OSE-81518 5mm to .187 Coupler. Check your cable for size before purchase.